From the creator of Riverdale comes the Chilling Adventures of Sabrina, a new Netflix eries based on the classic Archie comic series. This prequel YA novel tells an all-new, original story. It's the summer before her sixteenth birthday, and Sabrina Spellman knows her world is about to change. She's always studied magic and spells with her aunts, Hilda and Zelda. But she's also lived a normal mortal life -- attending Baxter High, hanging out with her friends Susie and Roz, and going to the movies with her boyfriend, Harvey Kinkle. Now time is running out on her everyday, normal world, and leaving behind Roz and Susie and Harvey is a lot harder than she thought it would be. Especially because Sabrina isn't sure how Harvey feels about her. Her cousin Ambrose suggests performing a spell to discover Harvey's true feelings. But when a mysterious wood spirit interferes, the spell backfires... in a big way. 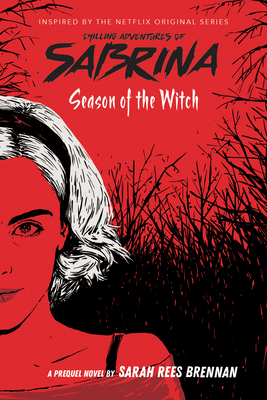 This exclusive prequel novel will reveal a side of Sabrina not seen on the new Netflix show. What choice will Sabrina make... and will it be the right one? Sarah Rees Brennan is the author of The Demon’s Lexicon and Lynburn Legacy series; Tell the Wind and Fire and In Other Lands; and several collaborations with writers Cassandra Clare, Maureen Johnson, and Kelly Link. She lives in Ireland.